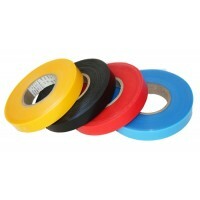 XLPE Repair Tape- Campbell International Specialist Tapes. XLPE repair tape is used to repair LT cables. Our range of tapes is suitable for use on XLPE (Cross-Linked polyethene) insulated cabling in order to make non-destructive repairs, strengthen and to remove minor defects in the insulating layer. XLPE is a thermoset material produced by the compounding of LDPE with a crosslinking agent such as dicumyl peroxide. Al Gilbert and Frank Precopio invented XLPE in March 1963 in the GE Research Laboratory located in Niskayuna, New York. In this process, the long-chain PE molecules “crosslink” during a curing (vulcanization) process to form a material that has electrical characteristics that are similar to thermoplastic PE, but with better mechanical properties, particularly at high temperatures. XLPE-insulated cables have a rated maximum conductor temperature of 90°C and an emergency rating of up to 140°C. Crosslinked polyethylene (XLPE) has become the globally preferred insulation for power cables, both for distribution and transmission system applications. This insulation system provides cost efficiency in operation and procurement, as well as lower environmental and maintenance requirements when compared to older impregnated paper systems. The XLPE Repair Tape is already cross-linked so no further time is required for Cross-Linking/Curing. The ideal temperature to process is 'Just above the melting point.' One should avoid spot heating, one of the ways to achieve this is to wrap a metallic tape over the XLPE Repair Tape and then apply heat indirectly through the metal tape. Our stock specification is as below; please note we can supply to any standard specification. Please contact our sales team on +44 (0)1732 773364 for current prices and to make an order. We are happy to supply to both the UK and internationally. Disclaimer: Please note that this video provides suggested use only and Campbell International or any connected parties cannot be held responsible for misuse of the product, its application or any accidents occurring in connection with the product. Step 1: Clean the surface to be repaired, thoroughly to remove any dirt/grease etc. Step 2: At the spot where pitting has taken place due to sparking, fill up the spot using our tape and a regular soldering iron. Allow the affected spot to cool down. Scrub and clean the surface on the affected area again. Step 3: Tightly wrap the XLPE Repair Tape around the affected area in sufficient quantity. Ensure that the entire affected area is well covered with at least 4/5 layers of the Repair Tape. Step 4: Cover the XLPE Tape using Copper Tape or Brass Tape. Step 5: Apply heat using Hot Air Gun or blow torch on the covered area until the XLPE Repair Tape melts and homogenises with the original Cable Insulation. Step 6: Allow the Repaired portion to cool down. Remove the Copper/Brass tape. With experience, the amount of tape to be used, heat application time etc will be set. Use of brass/copper tape can be avoided once you gain sufficient experience. It must be understood that the results of the repair efficiency will differ depending on the correctness of the procedure followed. There is a minimum order quantity of 40 rolls. This can be made up of sets of no less than 10 of an individual colour. To discuss your requirements please Contact Us.Colours: Red, Black, Yellow, Blue, Brown, Green, Grey and Natural/White. Elongation: 200% minimum. Tensile stren..